At the workplace, you are sure to encounter some tricky situations every then and now. They may involve supervisors, subordinates, customers or co-workers. The reason can be personal or professional. Some personal issues arise when two people enter an argument, make a negative remark, harass, or misbehave with each other. Professional issues can include differences in professional attitude, the difference in ethical and moral values, differential work styles or any other issue related to work dynamics. There are different types of people working under a roof at any organization. Not everyone is your friend nor credible. Therefore, one must at all times proceed with caution. The best way to survive well in any organization is to adopt a strictly professional attitude and follow organizational policies diligently. Even when you are in an uncomfortable situation, following official policies will ensure you have a strong case. 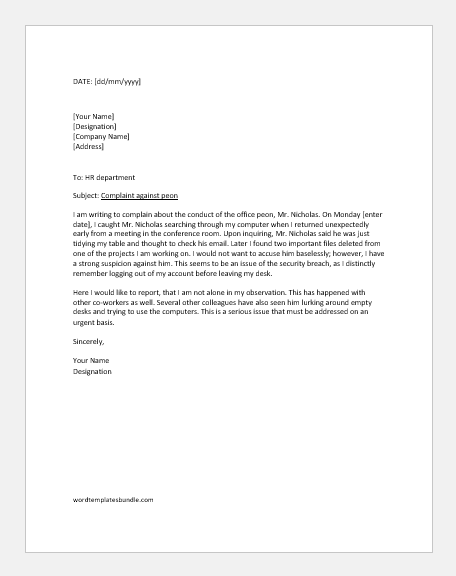 A complaint letter is often the last resort when talking to or teaching an employee has failed. 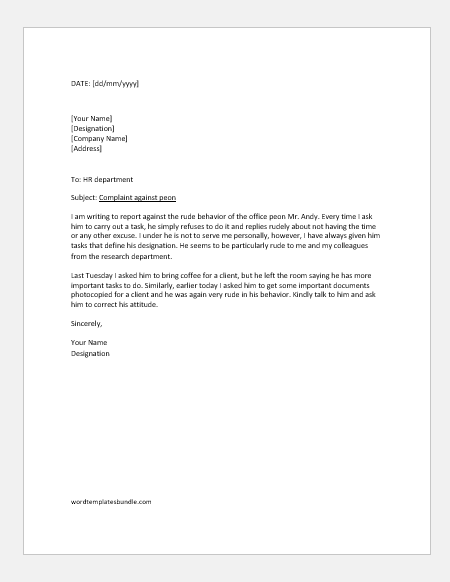 If you are writing a complaint letter about another employee, make sure to choose your words carefully otherwise it may backfire. I am writing to complain about the conduct of the office peon, Mr. Nicholas. On Monday [enter date], I caught Mr. Nicholas searching through my computer when I returned unexpectedly early from a meeting in the conference room. Upon inquiring, Mr. Nicholas said he was just tidying my table and thought to check his email. Later I found two important files deleted from one of the projects I am working on. I would not want to accuse him baselessly; however, I have a strong suspicion against him. This seems to be an issue of the security breach, as I distinctly remember logging out of my account before leaving my desk. Here I would like to report, that I am not alone in my observation. This has happened with other co-workers as well. Several other colleagues have also seen him lurking around empty desks and trying to use the computers. This is a serious issue that must be addressed on an urgent basis. I am writing to report against the rude behavior of the office peon Mr. Andy. Every time I ask him to carry out a task, he simply refuses to do it and replies rudely about not having the time or any other excuse. I under he is not to serve me personally, however, I have always given him tasks that define his designation. He seems to be particularly rude to me and my colleagues from the research department. Last Tuesday I asked him to bring coffee for a client but he left the room saying he has more important tasks to do. Similarly, earlier today I asked him to get some important documents photocopied for a client and he was again very rude in his behavior. Kindly talk to him and ask him to correct his attitude.